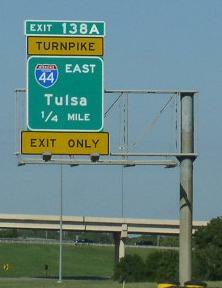 The Turner Turnpike runs east-west in Central Oklahoma. This connects the metro areas of Tulsa and Oklahoma City. This runs along the Historical U.S. Rt. 66 corridor between those two cities. The Oklahoma Transportation Athourity mainties this turnpike. In 1947, the state approved construction and opened the turnpike in 1953. 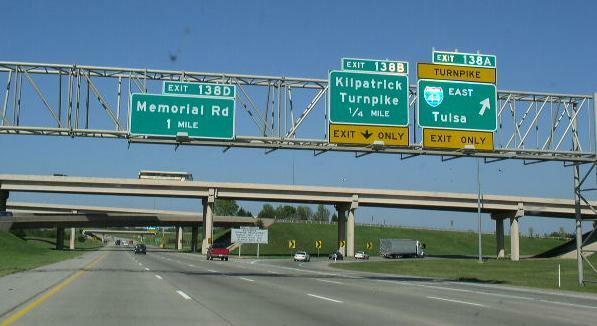 The John Kilpatrick Turnpike passes through the following metro ares. 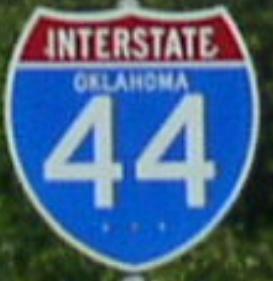 The Turner Turnpike crosses the following interstates. Overhead signs on NB I-35/EB I-44. BGS on NB I-35/EB I-44. NB I-35/EB I-44 at their split at the Kilpatrick and Turner Turnpikes.